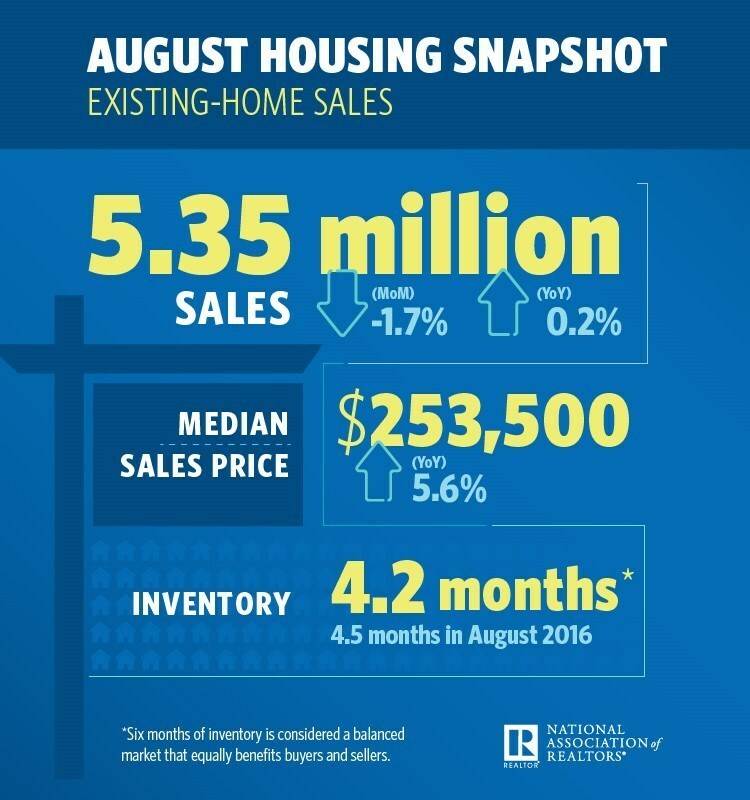 Existing-home sales floundered in August, posting higher than one year prior but lower than in July, the National Association of REALTORS® (NAR) reports. Existing-home sales totaled 5.35 million, a 1.7 percent decrease from July but a 0.2 percent increase from one year prior. Inventory decreased 2.1 percent to 1.88 million, 6.5 percent below one year prior. Inventory is currently at a 4.2-month supply. Existing homes averaged 30 days on market in August, six less days than one year prior. All told, 51 percent of homes sold in August were on the market for less than one month. The metropolitan areas with the fewest days on market in August, according to data from realtor.com®, were San Jose-Sunnyvale-Santa Clara, Calif. (29 days); Seattle-Tacoma-Bellevue, Wash. (30 days); Vallejo-Fairfield, Calif. (31 days); and San Francisco-Oakland-Hayward, Calif., and Salt Lake City, Utah (both 32 days). The median existing-home price for all types of houses (single-family, condo, co-op and townhome) was $253,500, a 5.6 percent increase from one year prior. The median price for a single-family existing home was $255,500, while the median price for an existing condo was $237,600. Single-family existing-home sales came in at 4.74 million in August, a 2.1 percent decrease from 4.84 million in July, but a 0.4 percent increase from 4.72 million one year prior. Existing-condo and co-op sales came in at 610,000, a 1.7 percent increase from July, but a 1.6 percent decrease from one year prior. Twenty percent of existing-home sales in August were all-cash, with 15 percent by individual investors. Four percent were distressed. The Midwest and Northeast saw positive activity in August, with existing-home sales rising 2.4 percent to 1.28 million in the Midwest, with a median price of $200,500, and 10.8 percent to 720,000 in the Northeast, with a median price of $289,500. Existing-home sales in the South and West fell, 5.7 percent to 2.15 million in the South, with a median price of $220,400, and 4.8 percent to 1.20 million in the West, with a median price of $374,700. First-time homebuyers comprised 31 percent of existing-home sales in August, a decrease from 33 percent in July. Overall, the housing market is on a continuing path to recovery—but its progress is threatened by recently proposed tax reform. Home staging offers a distinct advantage for sellers: a speedy sale. 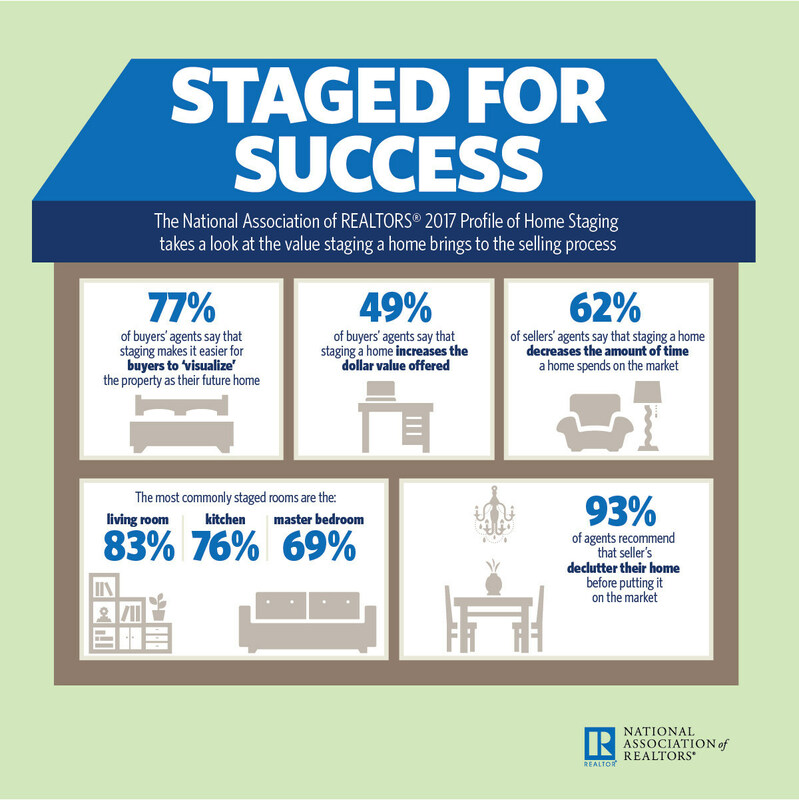 Sixty-two percent of sellers’ agents believe staging a home cuts down the time it spends on-market, with the majority believing it “greatly” reduces the window, according to the new 2017 Profile of Home Staging from the National Association of REALTORS® (NAR). Seventy-seven percent of buyers’ agents believe staging a home helps buyers envision themselves living in it, and 40 percent believe it prompts buyers who first saw the home online to visit it in person. Staging can also have a positive effect on home value. Thirty-one percent of buyers’ agents and 29 percent of sellers’ agents believe it adds anywhere from 1 to 5 percent, while 13 percent of buyers’ agents believe 6 to 10 percent and 21 percent of sellers’ agents believe 8 to 10 percent. The cost of staging is often fronted by the seller or sellers’ agent. Buyers’ agents caution, however, that staging is only beneficial if the home is staged to appeal to general, not specific, preferences. Most buyers’ and sellers’ agents believe the living room is a key space to stage, as well as the kitchen, the master bedroom and the yard. They also believe decluttering, depersonalizing and a deep clean—beyond staging—are essential for a show-ready home. Thirty-eight percent of sellers’ agents stage all of their listings before placing them on the market, while 14 percent only stage listings that require it. A near-even 37 percent do not stage their listings at all.